Rather like bracket clocks, the early longcase clocks were made by the greatest of clockmakers such as East, the Fromanteel family, the Knibb family, Henry Jones, John Wise and Thomas Tompion. First housed in the 17th century in simple ebonised or walnut veneered cases of classic proportions and small size, they employed the verge escapement before the anchor escapement became the norm in the early-to-mid eighteenth century. 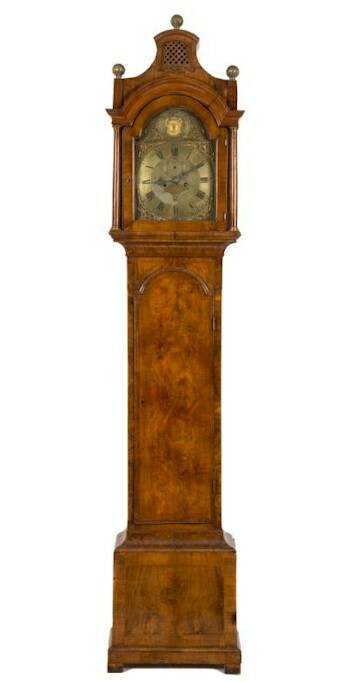 That these longcase clocks tend to fetch the highest prices comes as no surprise. A Walnut Longcase Clock by Thomas Hunter (Junior) of London (FS24/736). The majority of provincial longcase clock examples from this earlier period are known to be housed in oak cases and have a variation on the lantern clock thirty-hour, bell striking movement. Good, original pieces of this type are becoming increasingly sought after, especially those with decorative inlay to the case fronts. As the eighteenth-century progressed, and clocks became an important part of many households, so the numbers making clocks increased dramatically, especially those making longcase clocks in the provinces. These clockmakers include Henry Hindley in York, Whitehurst in Derby, Porthouse in Penrith, James Woolley of Codnor and Samuel Deacon of Barton-in-the-Beans. The emergence of mahogany to the shores of Britain saw a decline in walnut and marquetry clock cases, although the fashion for lacquer longcase clock cases with raised chinoiserie work remained strong. It was to mahogany that the London makers of the Georgian period turned, with such classic designs as the pagoda-top, whilst many of the provincial makers stuck to the flat-top, or much-used swan-neck pediments, a style nearly always employed by the makers of the finely-proportioned Edinburgh clocks such as Robert Clidsdale and William Mackie. Westcountry-made longcases are always in demand and fetch good prices, especially by known names such as the Exeter clockmakers Henry Ellis, Jacob Loveleace, William Upjohn and Thomas Savage; Plymouth clockmakers Nathaniel Upjohn, Samuel Edgcumbe and the renowned chronometer pioneer and maker Thomas Mudge, who had moved from London, along with those well-known clockmakers from Totnes; William Clement and William Stumbels. With all antique clocks, the best prices are achieved for those examples which are original, well-proportioned and pleasing on the eye.